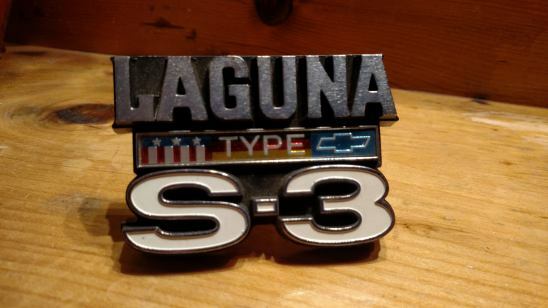 NEW 74 LAGUNA GRILLE EMBLEM. NO BOX $60. SHIPPED WITHIN THE 48 STATES. You '75/'76 Laguna owners can make this work for your cars, too. 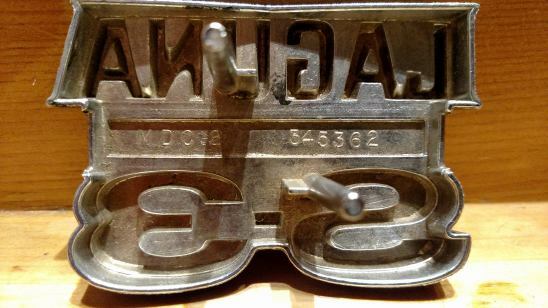 I bought one of these '74 NOS emblems a couple yrs ago for relatively cheap and squared off the backside with my Dremel and a file according to the dimensions on my old '75 emblem. Drilled a couple new holes in the mtg bracket and it turned out perfect. Great solution to the absolute shortage of '75/'76 NOS emblems vs the '74 emblem that seems to be much more available. Open to offers. The worst I can say is no. Hi Mitchell, the emblem is no longer for sale. I just bought a 75 Malibu that I'm going to put a Laguna nose on and I need the emblem for it.